Swine influenza a.k.a swine flu is a highly contagious acute respiratory disease of pigs caused by any virus of the family Orthomyxoviridae, that is endemic to pig (swine) populations. Strains endemic in swine are called swine influenza virus (SIV). 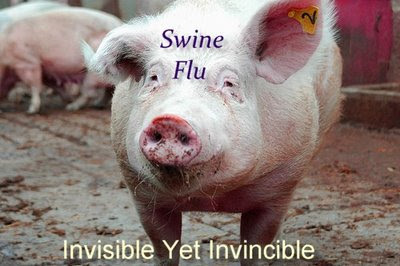 The classical swine flu virus (an influenza type A H1N1 virus) was first isolated from a pig in 1930. Swine flu viruses do not normally infect humans. However, sporadic human infections with swine flu have occurred. People who work with poultry and swine, especially people with intense exposures, are at risk of infection from these animals if the animals carry a strain that is also able to infect humans. SIV can mutate into a form that allows it to pass from human to human. The strain responsible for the 2009 swine flu outbreak is believed to have undergone this mutation. In humans, the symptoms of swine flu are similar to those of influenza such as fever, cough, sore throat, body aches, headache, chills and fatigue. A few patients have also reported diarrhea and vomiting. A diagnosis of confirmed swine flu can be confirmed by laboratory testing of a respiratory sample (a simple nose and throat swab) collected within the first 4 to 5 days of illness (when an infected person is most likely to be shedding virus). However, some persons, especially children, may shed virus for 10 days or longer. For the current outbreak, it is recommended patients be treated with oseltamivir (Tamiflu) and zanamivir (Relenza) to avoid drug resistance. For treatment, antiviral drugs work best if started soon after getting sick (within 2 days of symptoms). Is there a human vaccine available for swine flu? No vaccine is available for use in the current outbreak. Standard personal precautions against influenza include frequent washing of hands with soap and water or with alcohol-based hand sanitizers, especially after being out in-public. It is recommended that sick persons stay home away from work and limit contact with others to keep from infecting them. WHO has raised the level of influenza pandemic alert from the current phase 3 to phase 4. The change indicates that the likelihood of a pandemic has increased, but not that a pandemic is inevitable. WHO recommended not to close borders and not to restrict international travel. It was considered prudent for people who are ill to delay international travel and for people developing symptoms following international travel to seek medical attention. The Government on Monday issued a travel advisory for those traveling to countries affected by swine flu and put in place a screening system for passengers coming from these nations. All passengers coming from the affected countries -- Mexico, United States, United Kingdom, France, Canada and New Zealand -- would be screened and those who have reached here till 10 days back would be tracked down and asked to report to the nearest medical centre, Director General Indian Council for Medical Research (ICMR) Dr V N Katoch said at a press conference. “As of now we are concentrating on prevention of the infection spreading from person to person as in India there is no scenario of the diseases spreading from animals till now," Director of the National Institute of Communicable Diseases (NICD) Shivlal said. The States have also been advised to review their preparedness to investigate and contain any suspected cluster of influenza like illness. Guidelines to this effect have been sent to all the state surveillance officers. [Media Reports].